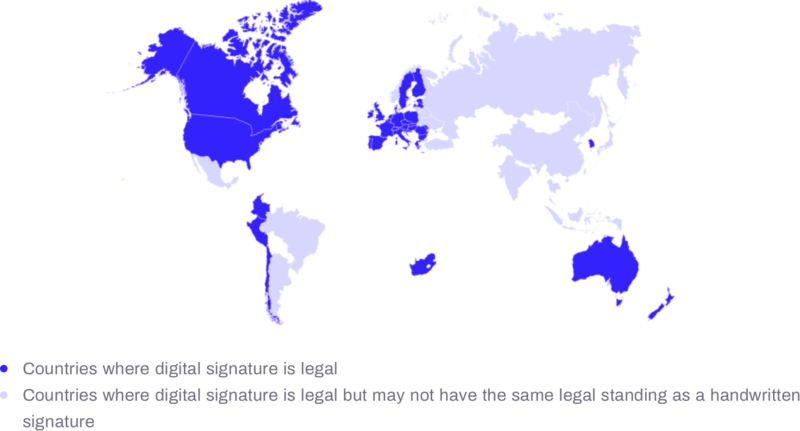 Contractbook's digital signature is legally binding and valid in most countries. Contractbook has electronic records of all contracts. They are encrypted and locked from editing after signing them, and they are stored safely in a cloud based service, which can be retrieved as .pdf file, at any time to support the existence of a contract. In case you are obliged to use the Official Danish National Signature (NemID) we do facilitate the use. Contact us for more information in that regard. Danish law does not require written signature for a valid contract - they are valid if both parties reach an agreement - agreeing verbally, electronically or signing it on a physical paper document. Sometimes, evidence is needed in court to prove your case. The first electronic signature directive was published by the European Commission in the end of 1999. Because it was directive, and not a regulation — many European countries interpreted the law in their own ways, which became patchwork of different laws. Some EU members adopted very strict laws and others made it more liberal. Also, the members of European Union did not recognized each others electronic signature laws. That caused a lot of confusion and The European Union could not move forward towards united solution. Everything changed when in 2011, European Commission decided to repair the law and create a united European digital market. After reviewing the Electronic Signature laws in European Union countries, in 2014 European Commission adopted a new regulation termed eIDAS. The goal of the new law was to ensure security and confidence in Electronic signature, therefore creating mutual Electronic signature recognition system through all the members of the European Union. eIDAS regulation took effect on July, 2016 meaning that it is not directive for interpretations and modifications. It is a single standard regulation which is effective in 28 European Union member states and Switzerland. Disclaimer: this overview of the laws is not legal advice, it is only for informational purposes only. Kommuniker med os i chatfunktionen nederst i højre hjørne af skærmen. Spørg os om alt eller efterlad os din feedback!